Here’s an issue I’ve been waiting to see made public: how global aid money was spent in the Ebola emergency. Amy Maxman’s recent Newsweek story will change the way you look disaster aid. Maxman managed to spend enough time in Sierra Leone and probe in the right places to illuminate some of the Ebola crisis’s most exasperating issues. I posted her February story on how the capital Freetown’s new Ebola case rate was not going to zero. She astutely noted Freetown has no traditional leaders with authority to lead the fight in their own communities, as they effectively did in the provinces. Now she’s written about how global Ebola aid money was spent in Sierra Leone during the epidemic’s peak. Again, she’s spot on. How is it possible only 2% of foreign aid reached frontline Ebola workers? Read on. It’s hard for outsiders responding to an emergency to know how to donate efficiently — quickly and with the highest impact. Foreign governments and major foundations want to send money, but not actually spend it. They have to trust other organizations with local connections to act on their behalf. Actually, foreign governments and foundations pledged Ebola aid money. The wheels of bureaucracy turn slowly, emergency or no emergency. Less than half the $3 billion aid pledged reached the affected Ebola countries by the end of 2014 when the crisis peaked and was declining. Big Aid may have been frustrated in the past by immature and ineffective African government systems, and sometimes out-and-out corruption. So, many foreign governments and foundations bypassed the Sierra Leone government, and gave Ebola aid funds to the World Health Organization and Western nonprofit organizations. Some sent a few experts, like the US Center for Disease Control, to advise and train Sierra Leone government agencies or do diagnostic tests. Most individual donors don’t understand how aid organizations actually spend money. I didn’t until I got personally involved with a rural Sierra Leone community. Crises don’t happen in convenient places. Aid organizations either don’t have staff in the affected country, or in the remote places they’re needed. And in the Ebola emergency, they didn’t have the right kind of staff. Infectious disease ward nurses, sanitation crews, burial teams and community mobilizers were needed — all speaking local languages and able to respond to local customs on life and death matters. Ebola started and spread in remote villages. To reach these places, foreign aid organizations would be confronted with a total lack of familiar infrastructure. It takes 3-5 hours to drive 50 miles on impossible roads to reach small villages – with the right 4×4 vehicle. They’d find nowhere to stay or eat, difficulty buying bottled water or petrol, no electricity, no toilets, no internet connection, of course, and unreliable cell phone coverage. There’d likely be no Sierra Leone government presence, and therefore, no local host or suitable building to work in. They might find no one to be go-between with the community. They wouldn’t speak the local language and could encounter suspicious, even hostile, villagers they’re trying to serve. So, unless you’re Doctors Without Borders experienced in setting up mobile MASH units, you subcontract your work to locally based nonprofits. These nonprofits may in turn need to hire more local, but inexperienced, people to deliver emergency services. Most local nonprofits are not rurally based. They typically are in Sierra Leone cities, and they don’t necessarily have rural relationships or speak tribal languages. But they are at least in-country. These nonprofit workers drive to a town or village for a few hours and leave, having limited impact. But they spend lots of money nonetheless on staff, new employees, training, new vehicles and travel expenses. The funding pie quickly shrinks. Every time work and funding are handed off to another government, another agency within a government, or from a global aid organization to country and regional groups, a slice of the funding pie is eaten up. Maxman found less than 2% of the billions of Ebola aid money made it to frontline Sierra Leone health care and sanitation workers. She found a UK report that only 7% of EU funding for a Liberian Ebola program reached frontline workers. This is not exceptional. Before the Ebola outbreak, I asked Bumpeh Chiefdom Paramount Chief Caulker about development aid distribution. He said it’s common for only 10% of aid money to reach people in his chiefdom as actual goods and services. Twenty percent would be good for non-emergency aid distribution. Where did the rest of the Ebola aid money go? Much of donated money is going to highly paid foreign aid organizations and their employees. Or to pay for military flown in to build treatment centers that took so long they were hardly used. Salaries of foreign aid workers sent over – that could be 6-figures – are counted in the emergency aid figures. And they may get extra hazardous duty pay. They fly in, stay in expensive city hotels designed for foreigners, and travel in air-conditioned SUVs. Some were flown by helicopter daily to field centers. And they seldom engaged directly in what we thought we donated our money for – caring for people sick with Ebola. In emergencies, spending money efficiently is not the prime objective, as Maxman found. Speed is. But without established programs, that speedy spending in the Ebola emergency led to many mistakes and missed objectives. And cost many lives. A vicious circle continues. With the crisis over, foreign organizations pack up and go home. Under-developed local health care services are no better off. They can’t self-support the next crisis because we keep relying on foreign emergency aid organizations, instead of investing in building Sierra Leone’s health care capability. Yet we quickly forget how expensive emergency aid is. What’s the moral of the story? Certainly, you should understand the organizations to which you’re donating in an emergency. What is their track record in the country you’re trying to help? Consider small nonprofit organizations doing grassroots work in a country like Sierra Leone; don’t be automatically dubious. Find their websites and check what they’re doing. Sherbro Foundation was able to quickly fund life-saving programs for 40,000 people with very few US dollars. 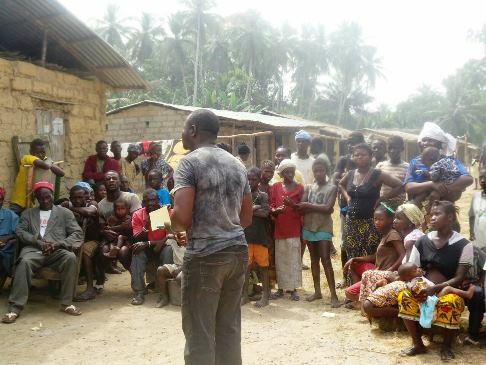 We funded 90% of the Ebola prevention work that Bumpeh Chiefdom led itself, with chiefdom leaders and volunteers. They focused on prevention, not waiting for people to get sick. We sent $9,000 USD by wire transfer, and they directly received $9,000 in local currency within days after we agreed on objectives. For $9,000, the chiefdom got results. They kept Ebola out for over 50 days, while it was raging all around them. After two isolated cases at Christmastime, the chiefdom again remains Ebola-free. That $9,000 would have paid the hotel bill for a single foreign aid worker “consulting” in Freetown for only a month and staying at the Raddison Blu for $270 nightly. Grassroots organizations like Sherbro Foundation are not involved in Sierra Leone for the short term. We’re continuing the work of community development.